Ok, run along, pick your piece of paper,(The size doesn't matter) and try as hard as you like, but sorry friends, no piece of paper can be folded in half more than 7 times! Lol. Good luck! Let us know if you succeed. 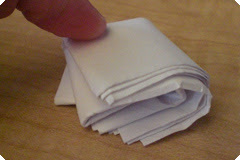 I even fold it into 8... nice post, i like dis!